Internet access to data representing the vital signs of key watersheds could be among the eventual benefits from an ARS program that’s now being expanded. A Web-based data system developed by a team of ARS researchers, data managers, and information-technology staff, the program compiles, documents, and organizes information on climate, water, and soil as well as on management and economic practices. Soil scientist Jean Steiner and hydrologist Jin-Song Chen at ARS’s Grazinglands Research Laboratory in El Reno, Oklahoma, spearheaded the STEWARDS program in collaboration with soil scientist John Sadler of ARS’s Cropping Systems and Water Quality Research Unit in Columbia, Missouri. STEWARDS will integrate information from 14 areas, nationwide, that are part of ARS’s Watershed Assessment Study. “This is a big change in how ARS handles watershed research data,” says Steiner. USDA and ARS have conducted watershed research since early in the 20th century. But the data has been used to address region-specific research needs and disseminated independently at each research location. “This has greatly reduced its accessibility and usefulness for policy-relevant, multisite analyses,” says Steiner. STEWARDS will bring together data from all these watershed studies, boosting the efficiency of researchers working within and across locations with diverse collaborators. Chen says a prototype of STEWARDS, accessible only to El Reno researchers, has been in use for almost a year at the Fort Cobb Reservoir and Little Washita River, two ARS experimental watersheds in Oklahoma. Both locations exhibit problems that CEAP and STEWARDS are designed to monitor. 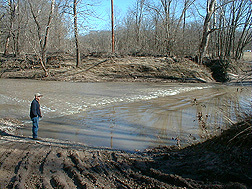 After further development, STEWARDS will be implemented at other ARS-researched watersheds, first in Iowa and Missouri. Access will initially be offered to researchers involved with CEAP and then extended via a public website. It’s hoped that STEWARDS will eventually include data from projects sponsored by other USDA agencies that are contributing to CEAP. This would increase to more than 30 the total watersheds involved in the database.—By Luis Pons, Agricultural Research Service Information Staff. 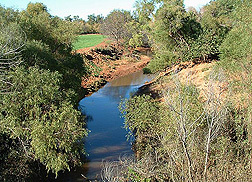 This research is part of Water Resource Management, an ARS National Program (#201) described on the World Wide Web at www.nps.ars.usda.gov. Jean L. Steiner is at the USDA-ARS Grazinglands Research Laboratory, 7207 W. Cheyenne St., El Reno, OK 73036; phone (405) 262-5291, fax (405) 262-0133. "STEWARDS—for Access to Vital Watershed Data" was published in the August 2006 issue of Agricultural Research magazine.